DC Comics' most iconic hero has reached his 75th anniversary, and to commemorate the milestone director Zack Snyder is producing a new animated short centering on The Man of Steel. It's a bird, it's a plane, and 75 years ago the world found out that it is, in fact, Superman. 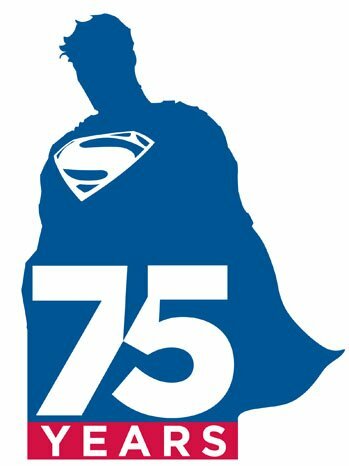 The Last Son of Krypton has been fighting evil and serving as an iconic representation of all things decent for the better part of a century, and now that we've reached his 75th anniversary, DC Comics and parent company Warner Bros. want to ring in the event with all due reverence. The plan (at least as far as we know it) is two-fold: First, DC Comics is unveiling a new logo specifically designed for the anniversary. That's the image you see at top-right. It's understated, yet appropriately majestic. I like it, which is probably good as Warner Bros. plans to use the logo on all Superman-related products across the board, from films to comic books to videogames and whatever other media they can think to squeeze Clark Kent into. Second, director Zack Snyder (the man behind the upcoming Man of Steel live-action film adaptation) is producing a new two-minute animated short based on Superman's adventures. More specifically, the short is said to be an homage to Superman's cinematic history, from the Max Fleischer cartoons of the 1940s to the Bruce Timm animated series of the 1990s and everything in between. There's no release date nor casting info for the short as of yet, but expect those details to emerge shortly. Of course, DC is also planning to commemorate the world's most famous superhero in its own unique way: Superman is getting a new comic book series dubbed Superman Unchained which will be written by Scott Snyder and illustrated by Jim "I drew X-Men #1" Lee. That book is slated to debut on June 12. Speaking personally, as much as I approve of these efforts, I don't think it's possible for anyone (even as powerful a media conglomerate as Warner Bros.) to properly celebrate how important Superman has been, not only to pop culture but to humanity's general zeitgeist since the character was first introduced. He's not just the world's most popular superpowered spandex fetishist, Superman stands as a "living" example of the human ideal. Forget that the dude can leap tall buildings and punch jerks into the sun; His greatest power has always been his genuine goodness and unwavering nobility. Moreso than any other hero, Superman proves that comic books are our modern mythology, and his existence as the most popular comic book hero only reinforces the idea that he's everything humanity can and should strive to be. Here's to another 75 years.